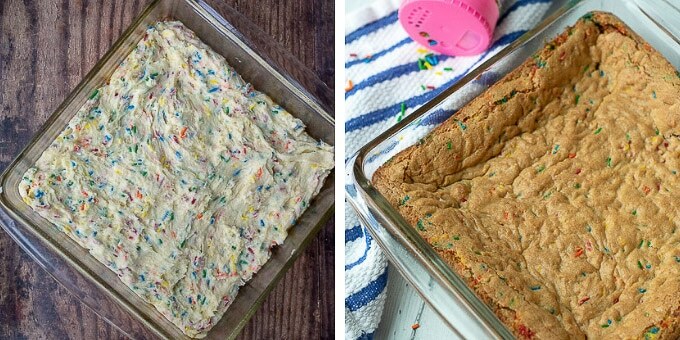 What Makes These Sugar Cookie Bars The Bomb! If you’re a fan of big, thick, and soft sugar cookies (hello Lofthouse! ), get ready for an even more swoon-worthy dessert! Although I’d never turn my back on a traditional cookie, I do love how easy bar cookies come together. Similar to Snickerdoodle Bars, Sugar Cookie Bars require no rolling or shaping. Mix the batter together in one bowl, dump it in a pan, and simply throw it in the oven. An emergency dessert can be ready in no time for all occasions! Plus, decorate Sugar Cookie Bars seasonally for all holidays. Scroll down ⬇️to check out different festive ideas! 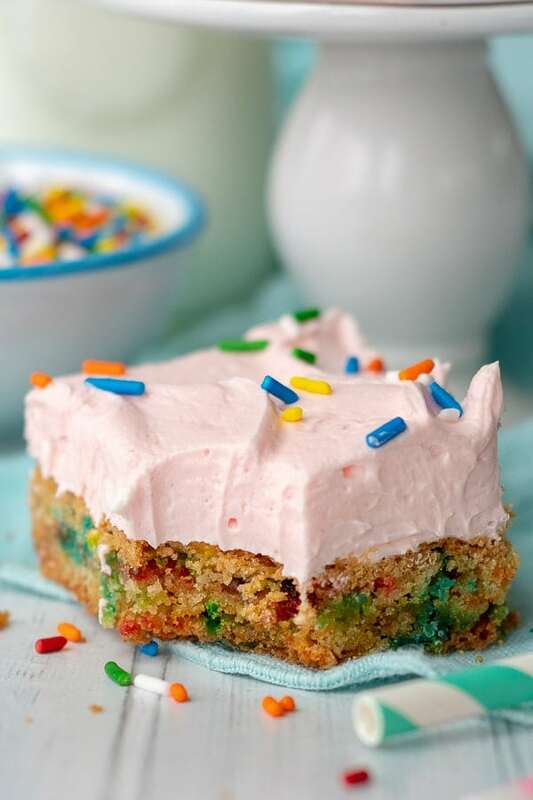 The thick, fluffy layer of buttercream frosting on Sugar Cookie Bars are an homage to the best dessert that has ever hit my lips. Chicago’s Sweet Mandy B’s Bakery makes gloriously huge sugar cookies with a mound of frosting on top. Anytime I go into the city (my husband also found a cookie “mule” for interim times), I have to inhale one of those cookies. So yes, the amount of frosting on these Sugar Cookie Bars is aggressive. You have a problem with that??? If you fall on more the sugar-sane side of things, you have two options. Either halve the frosting recipe or double the dough and bake in a 9X13 pan. 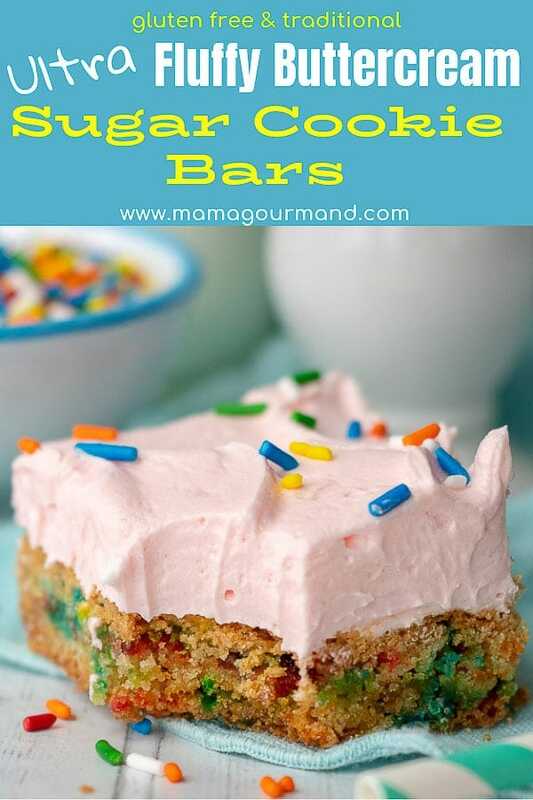 Make Sugar Cookie Bars For All Holidays! 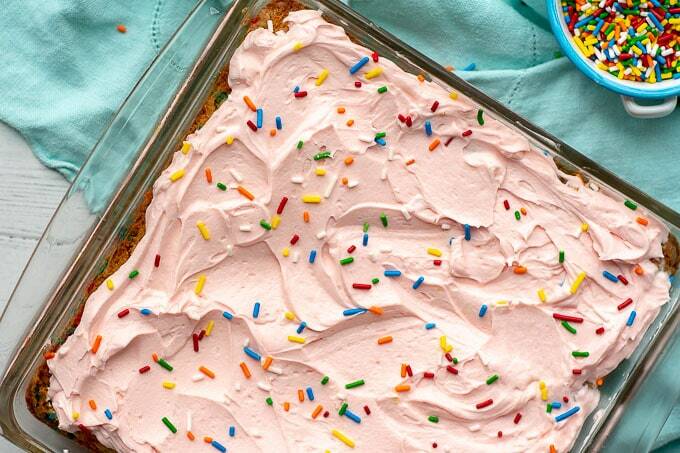 4th of July or Memorial Day – Use red, white, and blue sprinkles and leave buttercream white. Christmas – Use holiday sprinkles or top with crushed candy canes. Leave buttercream white or tint green. Valentine’s Day – Bake bars and cool. Then use a heart-shaped cookie cutter to trace around and cut out. 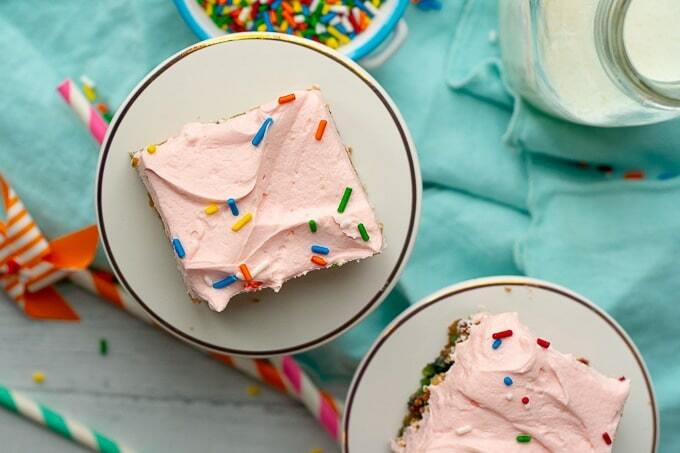 Frost with pink buttercream and Valentine’s sprinkles. Mix the butter and sugar together until very light and fluffy. Add the salt, baking powder, baking soda, cornstarch, and flour. 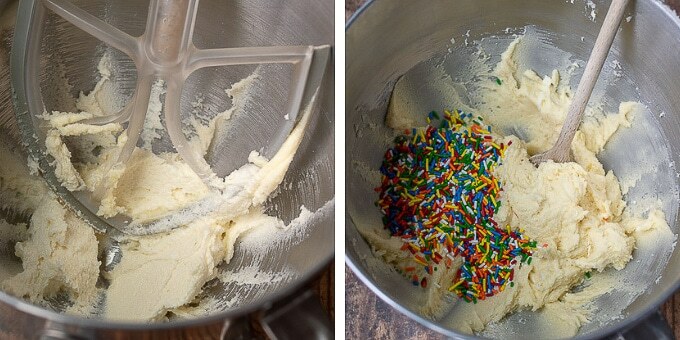 Mix in sprinkles. Bake until lightly browned. Cool and frost with buttercream frosting (recipe included). For a slightly different flavor substitute almond extract for the vanilla. Be sure to use sprinkles or jimmies rather than nonpareils (tiny ball sprinkles). Nonpareils’ color will bleed into the dough. I make this recipe all the time using gluten free flour. My preferred brand is Cup 4 Cup gluten free flour, which I substitute 1 to 1. For a thinner layer of frosting, half the buttercream recipe. 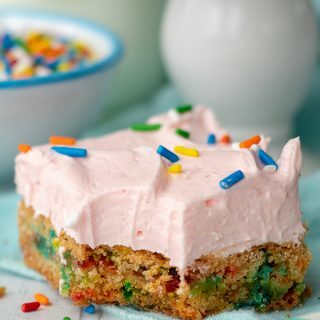 Alternatively, double the sugar cookie bar recipe, bake in a 9X13 pan, and keep buttercream frosting the same. 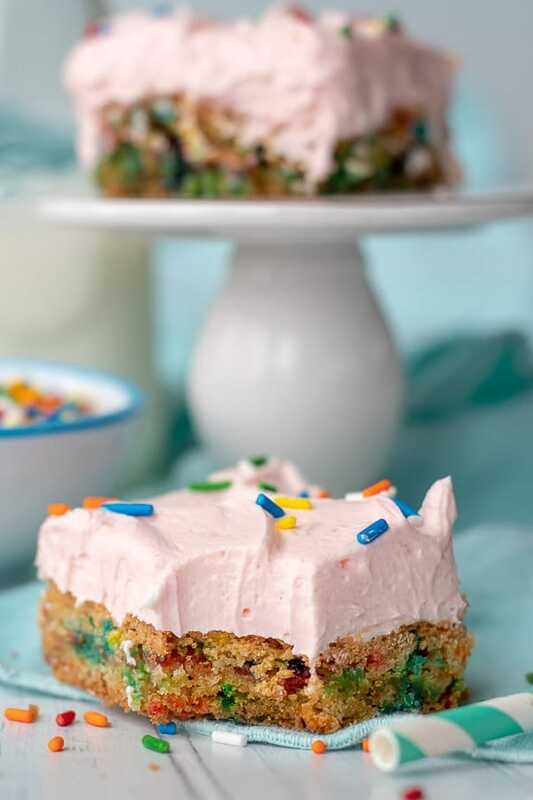 SAVE THESE SUGAR COOKIE BARS TO YOUR PINTEREST BOARD! Preheat oven to 350ºF. Spray a 8 X 8 baking pan with cooking spray and set aside. In a large bowl cream together the butter and sugar together until very pale, light, and fluffy, about 3 minutes. Beat in egg, yolk, and vanilla until well mixed. To the bowl add salt, baking powder, baking soda, and cornstarch. Mix well. Gradually add the flour on low speed until just combined. The dough will be very thick. Stir in sprinkles. Press into the prepared baking pan and bake for 25 minutes (about 5 - 10 minutes longer if using gluten free flour) until a toothpick inserted in middle comes clean. The bars will be lightly browned. Allow the bars to cool completely on wire rack before frosting. They will sink slightly in the middle as they cool. Tip: This makes a very thick layer of frosting (which I have no problem with! ), but if you'd prefer a thinner layer, half the recipe. In a large bowl beat the butter until light and creamy. Add the powder sugar, heavy cream, vanilla, and pinch of salt gradually on low speed until mixed in. Increase mixer to high and beat until very light and fluffy, about 7 minutes. 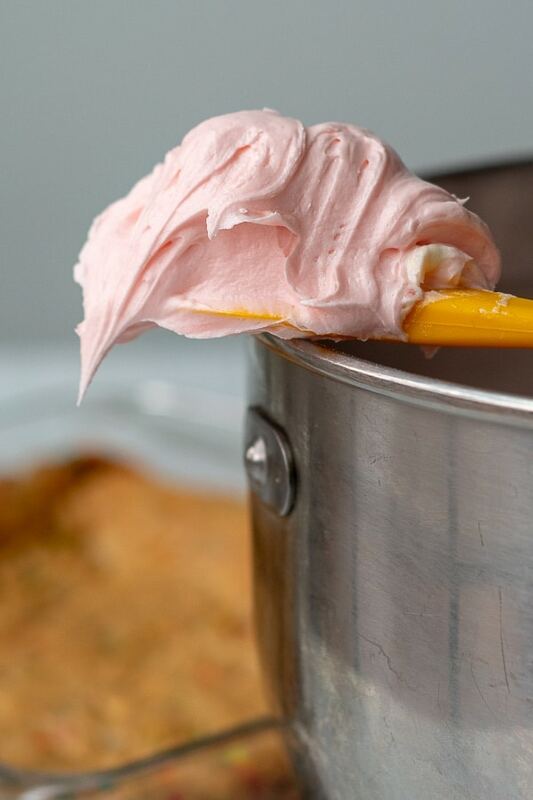 Tip: Beating for a long time is what makes this frosting extremely fluffy. Mix in food coloring, if using. Be sure to use sprinkles or jimmies rather than nonpareils (tiny ball sprinkles). Nonpareils' color will bleed into the dough. 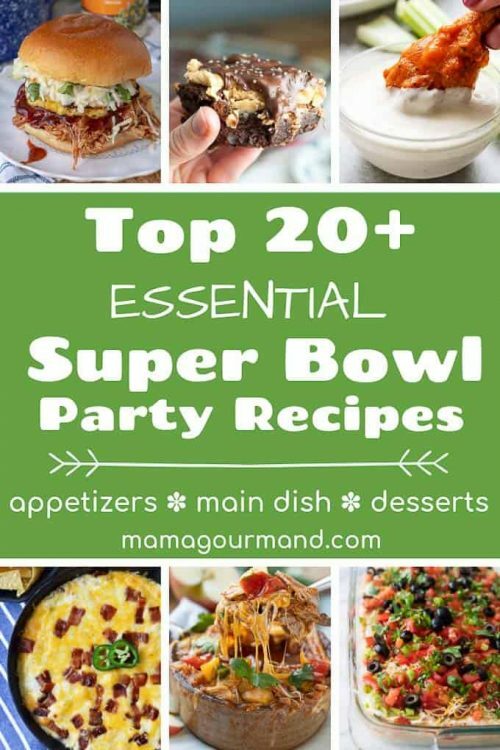 I made these for our Super Bowl party and they were super rich and yummy. I would half the frosting recipe next time though. Not that too much butter cream is a bad thing! Very pretty too. Yes, the amount of buttercream isn’t for the faint of heart. I LOVE buttercream, though! Glad you liked them. I always use cup 4 cup flour too. These are delicious. I could eat the whole bowl of the buttercream frosting! Incredibly delicious! Always a hit when I bring them to a gathering – and so much easier than sugar cookies! Morgan, I agree! 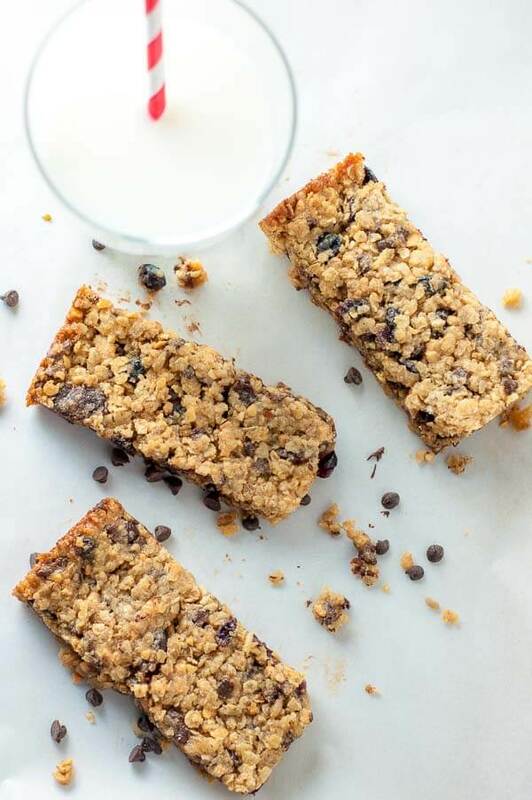 Bar cookies are so much easier to whip up. I’m glad you liked them! Thank you! 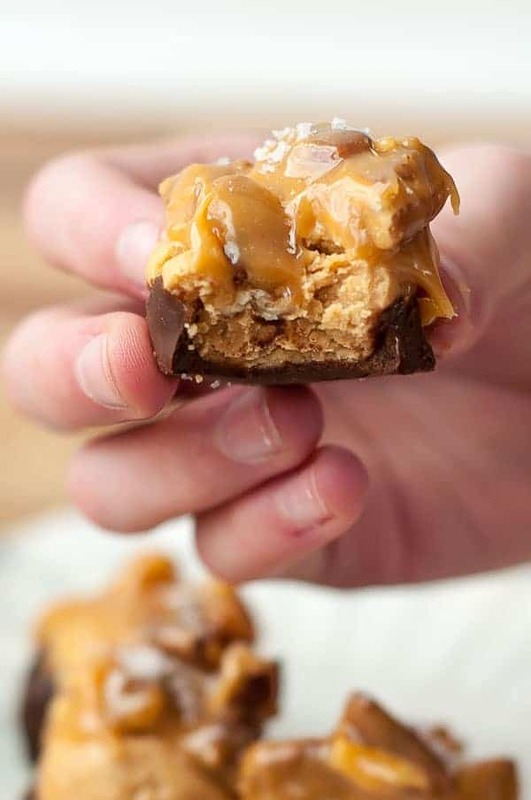 I have a hard time even looking at the pictures of these because I want to eat them so bad. They are the best!